We take great pride in the quality and workmanship of our merchandise and want you to be completely satisfied with your purchase from B2C Jewels. If, however, for any reason you wish to return your purchase, we will gladly refund, replace, or exchange any unworn item(s) within 30* days of delivery date. A pre-paid shipping label will be provided FREE of charge (for domestic orders) to return your item(s) – limited to one per customer. Please visit the Return Order section and follow the instructions to initiate your return. When complete, please print the return invoice. Once your return order request is submitted, we will email you a fully insured pre-paid FedEx return shipping label within 48 hours (Monday-Friday). Please note that our return shipping address will be different that our office address as it goes to our insurance company for additional security. Place a copy of the return invoice (generated in step 1) in a new and unused SMALL FedEx box, along with the returned item(s) and any original documentation. The return shipping label will contain an outer label and an inner label. Attach the inner FedEx return label to the small box. Place the small FedEx box inside a new and unused MEDIUM FedEx box and attach the outer label on the medium box. please note:We will NOT accept any packages that are shipped back to us in a used box. Drop off the sealed package to any authorized FedEx shipping center and obtain a receipt of the drop off. For security purposes, for items valued more than $10,000 please make sure to send the return label between Monday to Thursday ONLY. (Please do not drop off outside these days as insurance will be voided). For items valued under $10,000 packages can be dropped off any day of the week. Click here to find a FedEx Service center. Do NOT use a FedEx Drop Box. The return carrier to use is at the sole discretion of the customer; however recommended shipping carriers are UPS, Federal Express and USPS. The customer will be solely responsible for any loss or theft during transit to our return center if failing to adhere to the above guidelines. B2C Jewels extends the same 30 day return policy on orders shipped outside of the USA. The customer is responsible for all shipping costs, duties, VAT and taxes that may be incurred in returning the item(s) back to B2C Jewels. We do not accept C.O.D returns. If any duties, VAT or taxes were paid to the shipping carrier on receipt of the order, it is the customer's responsibility to contact them to request any refunds. In the event a package is refused at customs by the customer, or if a customer is unavailable to accept the package from the shipping carrier and B2C Jewels is charged any return shipping charges, duties, VAT or taxes, the customer will be responsible for all expenses related to the outbound shipment and return of the package. This amount will be deducted from the original sales amount when the refund is applied. Place a copy of the return invoice in your return packaging, along with the item(s) you are returning. For your protection, we advise that you insure the package for the full amount of the invoice plus shipping charges. B2C Jewels is not responsible for items lost or damaged while shipping. The return carrier to use is at the sole discretion of the customer, however the recommended shipping carriers are UPS and Federal Express. If you require assistance, please feel free to contact the sales department on 1-866-522-2539, Monday through Sunday 24 hours. Note: All returned items must have the white security tag attached on the item; Any item that is returned without the security tag attached will not be accepted. This excludes loose diamond purchases. 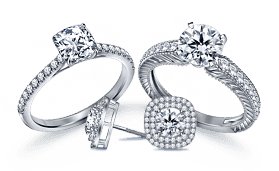 Packages of all jewelry items including loose diamonds must be received at our fulfillment center within 30 days from the delivery date. All returned items must be unworn and undamaged in the original boxes along with the original certificates where applicable. There should be no scratches or marks on the item and no sign of wear; the product should not have been altered in any way. Any items that are received that have been worn, damaged, or altered will not be refundable. Original shipping charges are non-refundable. All ORIGINAL diamond certificates (where applicable) and a copy of the original invoice must be included with the package in order for a full refund to be issued. Any package missing the original certificate(s) will be charged a fee of $150.00 per original certificate with no exceptions. B2C Jewels LLC is not responsible for any packages it does not receive, or returns not submitted in accordance with these guidelines. Payments received by credit card will be refunded the same way. Payments received by bank wire will be refunded by company check. A refund by bank wire can be requested for a charge of $40. Checks are sent via regular US Mail to the billing address in the original order (unless otherwise requested) and typically deliver within one week after the return has processed. Orders paid for through PayPal will be credited back to your PayPal account within two weeks. All international returns will be refunded by bank wire for a processing fee of $40. Please allow 3-5 business days for processing after a return is received. 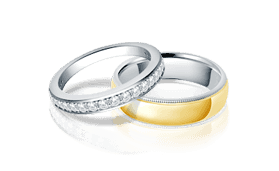 Special orders, such as custom mountings or jewelry pieces that were requested but are not specifically shown on our website, are non-cancelable and non-refundable items. We have attempted to recreate the appearance of our jewelry on our website as close to reality as possible. Keep in mind that different computer monitors may show variations of product colors and details. 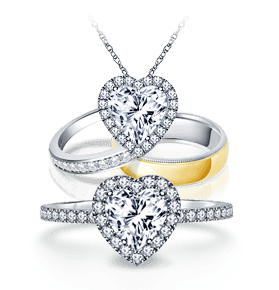 *Loose Diamonds (with or without a mounting) and Finished Jewelry purchased for $50,000 or above have 10 day return policy from the delivery date.